Shoppers at the city centre market are being encouraged to take time out at the stall to tell their quirky stories about life in Stoke-on-Trent to arts group, Red Herring. Red Herring are bringing their show, called Funny Peculiar, to Stoke-on-Trent’s The Big Feast over the August Bank Holiday weekend. 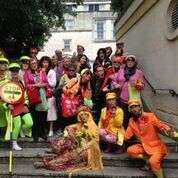 Red Herring will be in the city centre, from Tuesday, collecting stories of local life which will be woven into their Big Feast performances as “tour guides” Leslie and Lesley take groups of people wearing headphones on a hilarious walk around the city centre. Funny Peculiar HQ will be in Hanley’s Market Hall, below the Potteries Shopping Centre, between 12 noon and 3.30pm from Tuesday, 11th to Friday, 14th August. Red Herring are just one of a diverse range of groups who have been commissioned by Appetite to perform at The Big Feast between Friday, 28 August and Sunday, 30 August. “Funny Peculiar is a unique outdoor performance led by two hilarious tour guides who are on a search to find Britain’s most eccentric people,” said Appetite Project Director, Karl Greenwood. “Red Herring would like anyone with a story to tell to pop into their Funny Peculiar HQ at Hanley Market to give them their tales of eccentricity and quirky behaviour. There is also an opportunity for budding actors to be part of the Funny Peculiar show. Red Herring and Appetite would like to hear from budding performers who want to attend workshops and rehearsals and then perform in the city centre during The Big Feast. To sign up or for more information about the content of the workshops, please contact Theresa Tainton on 01782 381373 by 7 August. People can pick up Funny Peculiar tickets in the Funny Peculiar HQ during opening times. Tickets start from £3.50 and places are limited for each show. 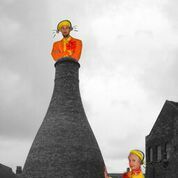 Tickets to all events can be found online at www.appetitestoke.co.uk. The full-line up of The Big Feast is also available on the website. Most acts and shows at The Big Feast are free and only a small number of shows are ticketed.